On the heels of my first televised interview (I’ll post a blog with the video in it soon) describing how I made my way from my previous career as a social worker to the world of makeup, I thought it fitting to share with you this bit of my back story… as well as what I’m currently carrying in my own personal makeup bag, as I told it to Sarah Howard, of beautybanter.com. “My first real intro to makeup started when I was 8. I was going to a friend’s house for a sleepover party, and out of the blue, my mom gave me a big ziplock bag of all sorts of products from the back of her makeup drawer. The ones that still stand out in my mind consist of a super shimmery grey eyeshadow, electric and pale frosty blue eye shadows, intensely pigmented peachy pink liquid cheek color, and an orange lipstick in a gold tube that I doubted she ever wore. I packed that ziplock full of tricks in my overnight bag and I was the hit of the party. Soon thereafter it was my birthday and my mom invited her friend, who I vaguely remember was a makeup artist – maybe at a local department store counter – over to do makeup on all my friends. We still have the photos, and it was the first time I saw my blonde/red eyelashes with mascara – and I LOVED it. I couldn’t believe I had eyelashes like everyone else’s- dark and thick and framing the shape of my eye! That was the beginning of me begging to wear makeup, and my interest in all things beauty. I got sidetracked for most of my early career-life, devoting my time to being a social worker – which couldn’t have been the furthest thing from the world of beauty or fashion- my own wardrobe not excluded. The one thing that I did insist upon was introducing ‘beauty days’ to my clients – particularly around special days like mothers’ day, or valentines’ day – where I’d either collect products to pamper them, or bring in makeup or hair artists to give on-site makeovers to the lovely ladies who came in to my office for help. I had the most gorgeous clients – of every skin tone, hair type, and ethnic background. I remember there would be times when I was floored by the beauty of a mother and daughter from west Africa, both with amazing skin, draped in gorgeous fabrics of rich color, or the stunning Latina clients with deep dark eyes and features that women pay plastic surgeons to recreate on their own faces. I was also really lucky to work with a large transgender population, and in particular, male-to-female transgendered folks who frequently dressed as women. It was from those clients that I learned the fantastic transformative power of makeup, and I knew I wanted to make a switch to try my hand at the beauty industry full-time. I didn’t know enough to be scared, so I marched into all the different agencies and eagerly told the agents who would speak to me that I was willing to work for cheap, and that I wasn’t a kid who would screw around on set – I was there to work! It all happened so quickly, and after assisting some of the best for about a year, the agency that I love – The Wall Group – offered to sign me as their first makeup artist on their brand new emerging talent board. That was nearly 6 years ago, and I can’t believe how far I’ve come, and how much I love this industry. I began my career in social work helping women feel better, and I love that I still get to do just that, every single day. I’m extremely passionate about the burgeoning green beauty component, and love finding out about new products made with ingredients that are safe enough to eat. This year I decided to leave NYC and spend awards season in LA, rather than flying back and forth. Plus, I hate the cold so it wasn’t a difficult decision. Award season is full of excitement for me. I love working with the beautiful and funny Isla Fisher, and got to switch up her look a lot for the Golden Globes (pictured) – and she loved it. Doing makeup on the gorgeous and talented actress, Amanda Seyfried, is always such a treat as well. I like doing all kinds of makeup, but what I like most, is making a face we’re all familiar with really dazzle on the red carpet. Nothing is better for me than when I hand my client the mirror after finishing creating her look and seeing her eyes widen and a smile spread across her face as she takes in her reflection. 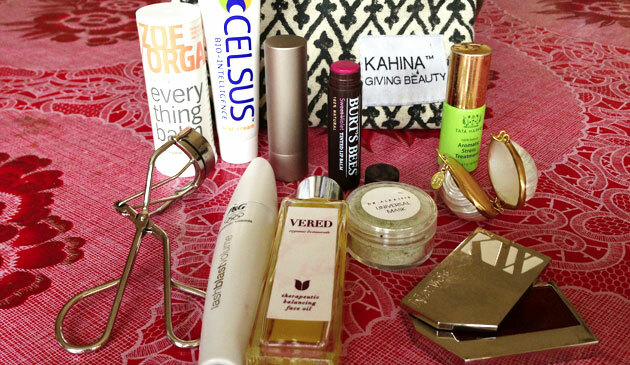 My makeup bag is from Kahina Giving Beauty. They make fantastic products and give back so much to the Berber women in Morocco who make them. The products in my bag are simple but contains exactly what my staples are when doing a red carpet look. Dr. Alkaitis Universal Mask: I carry the sample size in my purse just in case I travel and forget to bring the full size! This green mask is truly therapeutic – it soothes, nourishes, and calms my skin when it’s inflamed or broken out. The key is to keep it damp while it’s on your face – spritzing with water or hanging out in the shower, letting the steam keep it damp. Vered Organic Botanicals Balancing Face Oil: It’s an herb infused oil that contains anti inflammatory and anti bacterial components. My skin is so sensitive, and I love that this one never irritates it and I think, calms my breakouts. I use it day and night, and I’m never stingy with application. I only use oils on my clients, too which I know is why they always glow on the red carpet. Shu Uemura Eyelash Curler: Simply the best. Change the pad every 6 months, and get a new one every year, if you use it daily. Clamp it as close to the roots as you possibly can and your eye will instantly open. Every actress I work with knows I’ll be curling the hell out of her lashes. Cover Girl Lash Blast Mascara Very Black: I’m obsessed with lashes. This is my favorite, despite it not being a ‘green’ beauty product. I don’t care – it does the job and gives long, thick, lush lashes that stay all day- and I use, like, 10 coats. Kjaer Weis Lip Tint in “goddess”: I love this deep rich color, and that it’s sheer while still well pigmented. I love to use it on my cheeks, too! It looks awesome on so many skin tones, as well, and the color is totally buildable. Burt’s Bees Tinted Lip Balm in Sweet Violet: this is my go-to for every day, all day. I have a zillion of them. It’s 100% natural and such an awesome color. It’s also what I like to give my clients for the after party when I know they’re not going to be interested in keeping up their precise lipstick look that I created for them. This is easy, moisturizing, and full of color, and there are a number of other colors, so I can pick the one that matches each client best. Ilia Beauty Balmy Days Lip Balm: When I don’t feel like having any color on my lips, this is my favorite. It’s full of coconut oil and feels delicious. I give them out to clients to use at night leading up to red carpet events because they’re so penetrating and rich – they get a pout ready! Tata Harper Aromatic Stress Treatment Roll-On Oil: I keep this with me at all times, both to bring immediate relaxation to myself and my clients. I always roll some on my wrists before I start a makeup application so my client can enjoy the effects of aromatherapy – particularly before stepping out onto the red carpet. They generally ask to have some put on their wrists before leaving the house, too! Roots Rose Radish: The pretty little open shell on the right of the photo is another scent that I love from a really cool company started by a woman who’s a trained herbalist – and a doula! – and she makes everything she sells. This one is freakin’ delicious: rose, franinscense and patchouli – but not *that* kind of patchouli. It’s warm and earthy and rich and makes men go nuts in the best way when they smell it!